Generally speaking, we need to connect our Android devices to PC frequently so that we can transfer all kinds of files between them or manage Android on PC. As to the connection methods, different people have different operation habits. Some people would like to use USB cable to connect as it provides a fast transfer speed, while others tend to rely on Wi-Fi connection which is convenient to some extent. However, sometimes your USB cable may be not at hand and there is no network connection on your Android or PC. So, how can you connect Android to PC in this case? Luckily, here’s a free method which allows you to connect Android to PC wirelessly and without using network. 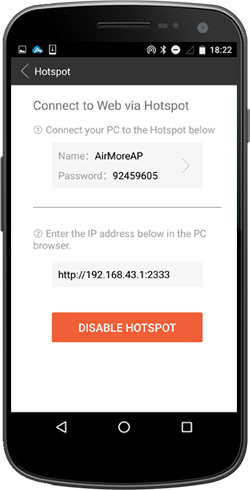 AirMore is a powerful and mature mobile devices management tool based on web. 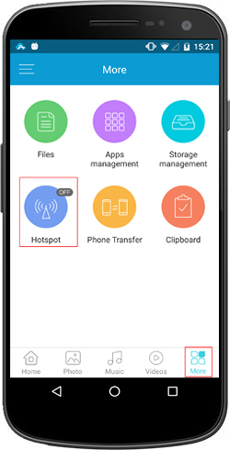 With this handy tool, you can connect your Android devices to PC (Mac & Windows) without using network and USB cable, and then manage nearly all files of Android on PC. Now, let’s see how to use this amazing connection method. Search this tool on Google Play store or click this button below to download it on your Android. Run it and click “Hotspot” to build a Hotspot with your phone. Connect your PC to the Hotspot and then enter the IP address in the PC browser (Chrome, IE, Edge, Firefox or Safari). Once connected, your Android information will show up on PC browser. It means that you’ve connected Android to PC without using USB cable and network. And you can manage all your mobile files on browser, such as photos, videos, music, documents, apps, contacts, messages and so on. In addition, it also allows you to mirror Android screen to PC. The Hotspot doesn’t need your mobile network. If you close your phone network, the Hotspot also works very well. You can build connection between phone and PC just by scanning a QR code. Connect Android and PC to the same Wi-Fi network. Visit “airmore.net” on your PC browser to load a QR code. Run AirMore on Android and click “Scan to connect” to scan that QR code. Then they’ll be connected successfully. With IP connection, you just need to enter an IP address in your PC browser to build connection. Click the button at the upper right coder of AirMore on Android and then open “Get IP”. Enter the IP address into your PC browser to build connection. In conclusion, with AirMore, you can really connect Android to PC without network and USB. Moreover, another three simple connection methods are available. Therefore, you will never have difficulty in connecting your Android devices to PC. Rating: 4.3 / 5 (based on 42 ratings) Thanks for your rating!